by Anne Carson from "The Truth About God"
"God only speaks in Bach," Samuel Adler told me when I showed him this poem and told him I wanted to set it for my commission from the NYVS. I had been looking for a poem by a living author for my NYVS commission. I had scoured the most obvious choices and also took people’s suggestions down the most unlikely paths. 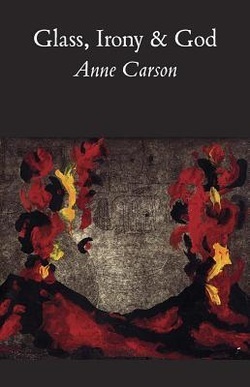 I found nothing that I really wanted to do until I came by a strange and brilliant book called Glass, Irony & God, by Anne Carson, full of hard-to-categorize “poems,” “essays” … a traveler’s guide to the fall of Rome? I was looking for something transparent in a single read while also peculiar and intriguing. I was also looking for something that to me makes sense for a chorus, or as I see it, a kind of cross-section, 16 members large, of our society, to sing. “God’s List of Liquids,” Carson’s account of God listing words under the entry “pleasure” in the “book of life,” fit the bill; I knew on my first reading of the poem. The piece was premiered at Merkin Hall in New York City on November 15, 2014 by the New York Virtuoso Singers conducted by Harold Rosenbaum.